Need to offload your pics, but still want to access them from your iPad? Here are a few solutions. My iPad is running out of storage space. If I move photos to an external drive and delete the original photos from Photos, will they still be accessed by iCloud? She’d also like to keep her photos in an iCloud Photo Library, but separate out the pictures she takes on her iPad. You might not get quite what you want here using only Apple products, but you could reach the right solution with Google or Amazon. The first option is to use the optimized option for iCloud Photo Library. In Settings > iCloud > Photos flip the Optimize iPhone/iPad Storage switch to on. This allows iOS to dump the full-resolution version of images and videos once they’re uploaded if the storage is needed for your iOS device. That might be the solution you need, but with only 32GB on your iPad, you still might constantly push up against the limit even with thumbnails. While you can copy images from your iPad to a Mac's internal or external storage, you can’t access images from a drive (even a USB thumb drive with an adapter) from your iPad. And Apple only lets you sync a single Photos library on the Mac with iCloud Photo Library, no matter on which drives you store the libraries. 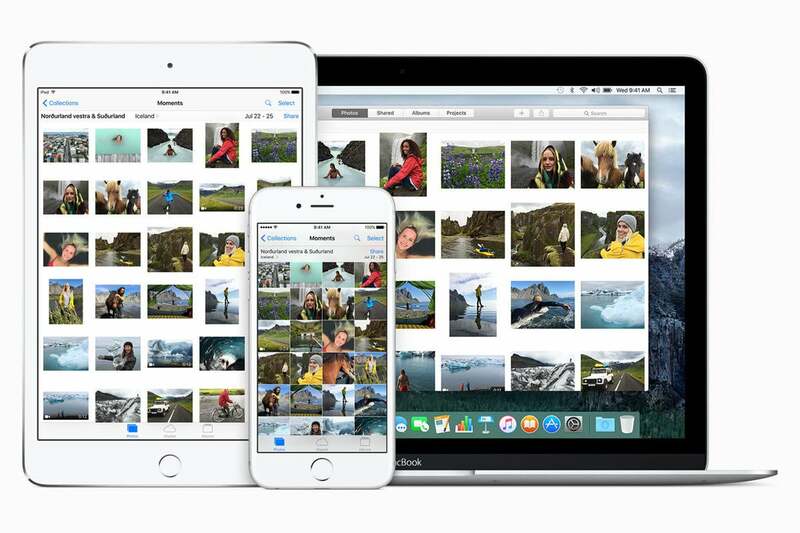 What you could choose is not to sync your iPad to iCloud Photo Library at all, but rather pick Google Photos or Amazon Drive, both of which have solid iOS apps and use inexpensive or free cloud storage and can upload media automatically as you create it. Amazon Prime customers get unlimited photo storage and 5GB of video (and other file) storage at no cost. Unlimited storage for everything is $60 for all customers. Google includes unlimited photo and video service if you agree to let it downsample images above 16 megapixels and videos above 1080p. Otherwise, you get 15GB across its mail, drive, and photo services, and can pay for additional storage. Once uploaded, the Google and Amazon apps don’t delete the media from your iOS device; you still have to manage that part. But you can then view all your uploaded pictures and movies from Google and Amazon iOS apps and websites. Google and Amazon’s apps act more like a view into cloud storage instead of a sync service, so the amount of data consumed on your device is relatively little. Update: This article originally mentioned an Amazon subscription for unlimited photo-only storage, which was discontinued in 2016. Prime subscribers continue to receive this as part of their membership.